This name, with variant spelling Harty and Hearty, is of Irish origin, and is an Anglicized form of the Gaelic "O'hA(tha)rtaight", meaning "descendant of Faghartach", from the prefix "O", meaning "grandson or male descendant of", and "Faghartach", a byname for a noisy person. Traditionally, Irish family names are taken from the heads of tribes, revered elders, or from some illustrious warrior, and are usually prefixed by "O", as above, or "Mac", denoting "son of". The older form of this name was O'Haherty, a phonetic Anglicization of O'hAthartaigh. The elimination of the internal "h" is rare in the Gaelic form, however, this occurs in this case; O'hAthartaigh has been abbreviated to O'Hartaigh or O'Harta, whence Harty. The name is mainly found in the province of Munster, principally the counties of Tipperary and Cork. Two interesting namebearers were Dr. John M. Harty (1867 - 1946), Archbishop of Cashel, and Lt. Gen. Oliver Harty (1746 - 1823), who after thirty years in the Irish Brigade remained in the service of France following the Revolution and was ennobled by Napoleon as Baron de Pierreburg. The family Coat of Arms is on a gold shield, a black fess, between three green trefoils slipped, with three gold falcons volant, the Crest being between two gold wings erect, each charged with a hurt, a falcon's head erased proper charged on the neck with a green trefoil slipped. 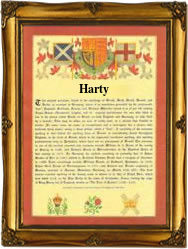 The first recorded spelling of the family name is shown to be that of John Harty, which was dated June 14th 1674, christened at St. Giles' Cripplegate, London, during the reign of King Charles 11, known as "The Merry Monarch", 1660 - 1685. Surnames became necessary when governments introduced personal taxation. In England this was known as Poll Tax. Throughout the centuries, surnames in every country have continued to "develop" often leading to astonishing variants of the original spelling.